The painter Daniela Ria from Milan, is well known for her precious series of dogs and cats portraits called Aristodogs & Noblecats. 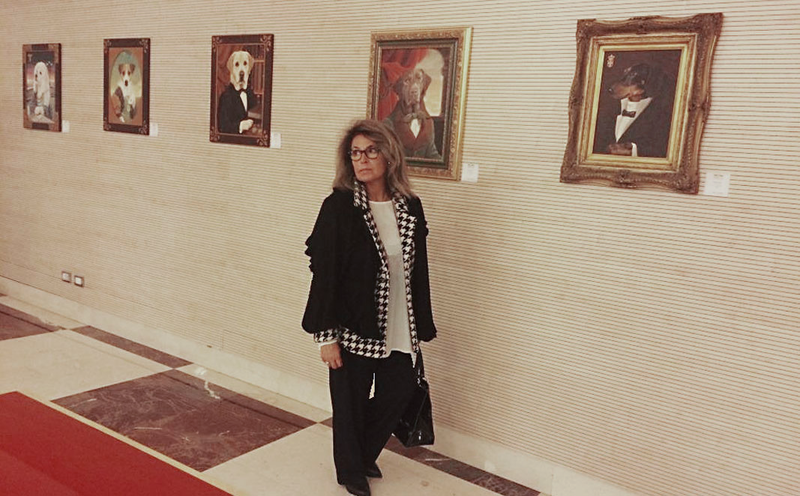 She reached the success in 1990 with her first important exhibition hosted at the antiquarian art gallery “Il Servo di Scena” in Milan, where she exhibited her paintings, emblematic of her passion for dogs and cats. From a photo she catches an expression, a proud glance, a peculiar pose, and then she transforms the subject into a true character, interpreting the personality of these animals and providing them with emotions and sensations from different historical periods. She surrounds the images with elegant light effects, picturesque landscapes or interior backdrops such as plush draperies, stately libraries, and other effects. The portraits are created using acrilics on canvans. Why did you choose to paint animals? Simply because I love animals and I love them deeply. I consider dogs and cats, that I have and that I‘ve had, as companions in life. They have followed me, every day, faithfully and patiently. As the English poet Lord Byron said…..“dogs have all the virtues of man, without his vices”….it’s an unquestioned truth! When I paint an animal on commission, I always do it with great respect. I am convinced that they have a soul. To paint animals, any animal, domestic or wild, it is not sufficient to be able to paint, but it is necessary to know the morphology, the origins, the temperament, and above all to observe their eyes and capture their soul. I believe that my characteristic is to achieve a painting that is created through a perceptive process, suspended between real representation and imagination. What I want to reach is always a visual emotion between realism and surrealism. Daniela Ria is a talented artist with a solid educational technique. She is proposing a new way of portraiture intended to reproduce the effige of dogs. She has a keen interest and passion for renaissance art and figurative painting. Her originality stems from an ironic energy and is transformed and elaborated into her portraits of dogs. Her work is intentionally avant grande and she is inspired by historical knowledge. She was discovered and widely commented by the Italian press when her work was exhibited at the Milano exhibition. This is where, to her surprise, she rediscovered her true trend. She has painted portraits for famous people as George Bush, the maestro Muti ,Fiona Swarovsky, Mike Bongiorno, Adriana Asti, Sergio Tacchini, Barbara Bouche, Paolo Limiti , Patrizia Rossetti, Antonella Clerici, and many others, enabling her to take her fame aboard. Having sensitivity allows her to enter into the emotional world of animals through her portraits. “Daniela Ria, the passionate Milanese artist, created her website Aristodogs and Noblecats and portrays the love of each customers pet through her humorous and skilful paintings. Stormy weather, theatrical curtains or an ancient library are suggested background images for portraits, to create humour and truth without changing the look of the portrait.